Rajesh Srinivasan concentrates his practice on trial and appellate litigation. Raj has written briefs for state trial courts, federal district and appellate courts, and the US Supreme Court. In addition to his brief-writing experience, Raj has drafted several comments to the Federal Communications Commission on rulemaking proceedings. Raj's briefing and counseling have covered a large variety of topics, including patents, health care regulation, criminal fraud, antitrust, telecommunications and bankruptcy. 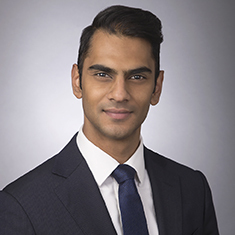 Raj has also assisted clients in responding to government investigations involving the False Claims Act and environmental regulations, and he regularly provides advice to health care providers regarding potential litigation and investigations. Prior to joining Katten, Raj served as a law clerk to the Honorable Pamela A. Harris of the US Court of Appeals for the Fourth Circuit. Before that, he served as a law clerk to the Honorable Mariana R. Pfaelzer of the US District Court for the Central District of California. As Judge Pfaelzer's clerk, he managed her patent docket and worked on patent cases involving computer software and hardware, DNA technology, and materials science. During law school, he was the managing editor of the University of Chicago Legal Forum. Shown below is a selection of Rajesh’s engagements. Co-author of brief on behalf of a financial institution in an appeal before the US Court of Appeals for the First Circuit arising from an insurance-coverage dispute. Representation of a pharmaceuticals company in appeals before the US Court of Appeals for the Federal Circuit. Court-appointed counsel and primary author of briefs in an appeal before the US Court of Appeals for the Fourth Circuit challenging the dismissal of a federal prisoner’s petition for post-conviction relief. Representation of a health care provider in regulatory matters. Representation of a health care entity in False Claims Act lawsuit. Representation of an individual in a Foreign Corrupt Practices Act investigation by the US Department of Justice and Securities and Exchange Commission. Principal draft of dispositive motion in a federal criminal fraud case.